Yesterday, The Mary Sue brought to my attention this whimsy and perfect collection and I knew I had to share it with you, because if you could afford it, who would not want to be cloaked in beautiful, space-themed fabric? I, for sure, would. The collection, created by designers Maria Grazia Chiuri and Pierpaolo Piccioli for Valentino's Pre-Fall 2015 collection, features a few dresses, skirts, coats, and boots (yes boots!) 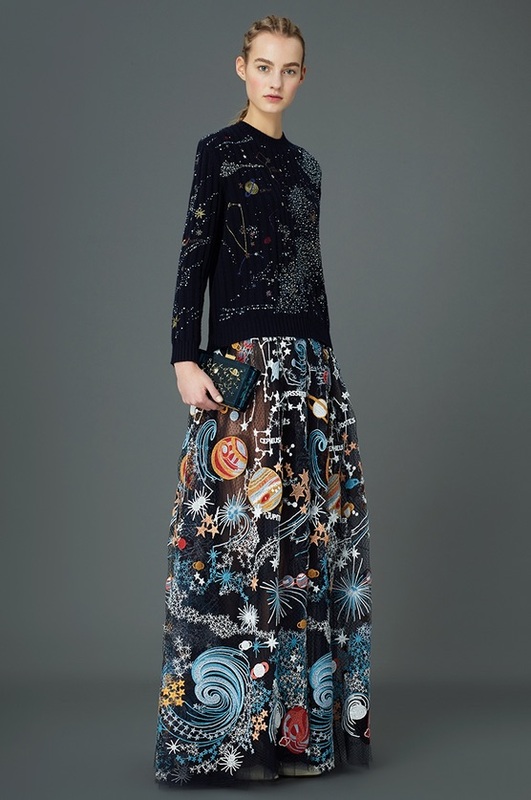 covered in space-inspired designs: moons, planets, constellations. Truly a way you can feel like you are walking in the stars, but with your feet planted on earth.